Carvallo, J.P.; Franch, X.; Grau, G.; Quer, C.
The use of quality models during the selection of commercial, off-the-shelf (COTS) products provides a framework for the description of the domains which the COTS products belong to. Descriptions of COTS products and user quality requirements may be translated into the quality concepts defined in the model, making selection more efficient and reliable. We propose a method for the construction of quality models for composite COTS-based software systems (CCSS), defined as systems that are composed by several interconnected COTS products. Selection processes carried out when procuring a CCSS require not a single COTS product to be selected but a set of them. As a consequence, instead of a classical quality model, we need a more elaborated one, defined as the composition of those models that belong to the domains of the COTS products that form the CCSS. 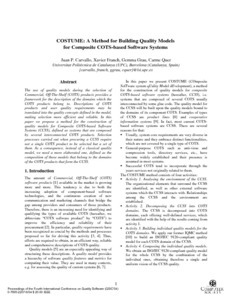 Carvallo, J.P., Franch, X., Grau, G., Quer, C. COSTUME: a method for building quality models for composite COTS-based software systems. A: International Conference on Quality Software. "Fourth International Conference on Quality Software, 2004, QSIC 2004: proceedings". Institute of Electrical and Electronics Engineers (IEEE), 2004, p. 214-221.